We rejoice at happiness of the blind. to the best of our power. Nippon Lighthouse made its small start in 1922 when the late Takeo IWAHASHI, who had became blind while studying at university, began the printing of Braille books at home, and then he opened his house to lend out his books to the blind people for free of charge. Then, 'Japan League of Societies for the Blind' and 'National Council of Social Welfare Institutions for the Blind' were organized, and he took office as the 1st chairman and so forth. 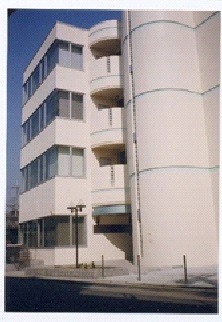 Nippon Lighthouse became social welfare juridical person in 1952 because of the enactment of Social Welfare Services Law. Takeo IWAHASHI passed away on October 28, 1954, leaving his dreams to publish 'The World Encyclopedia of the Blind' and to hold the Asian Conference on Work for the Blind unfinished, which were succeeded by Hideyuki IWAHASHI. 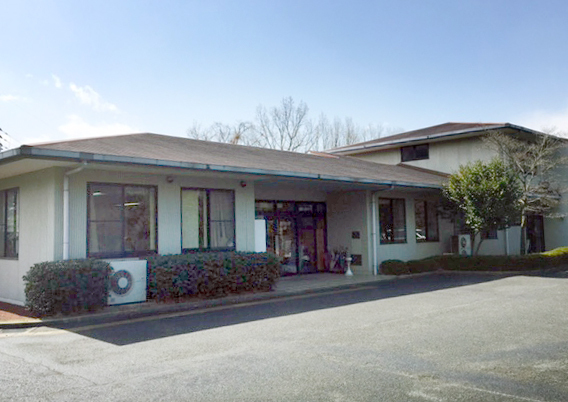 The new building was completed in 1960 at the present site and the first vocational & rehabilitation center in Japan was set up in 1965. The guide dog training center was set up in 1970. 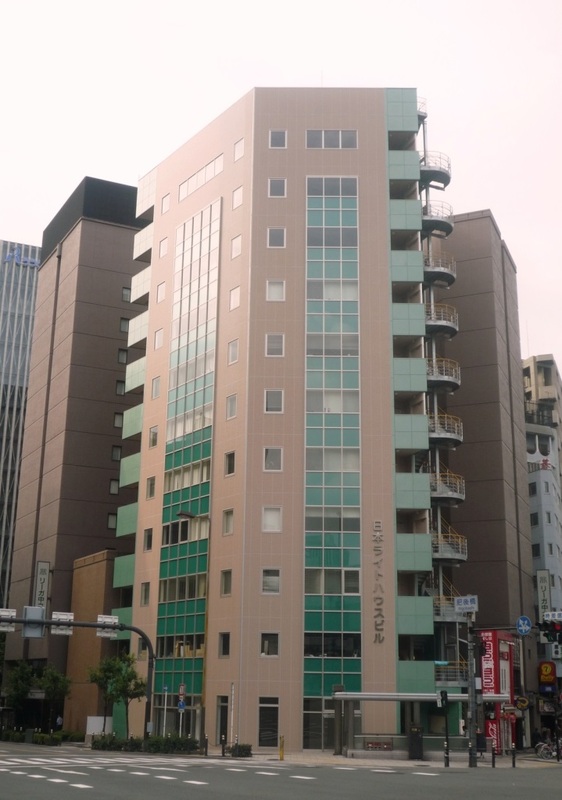 The new building of the library section was built in the downtown Osaka and started the enlarged activities as the Information & Culture Center (for the visually impaired). 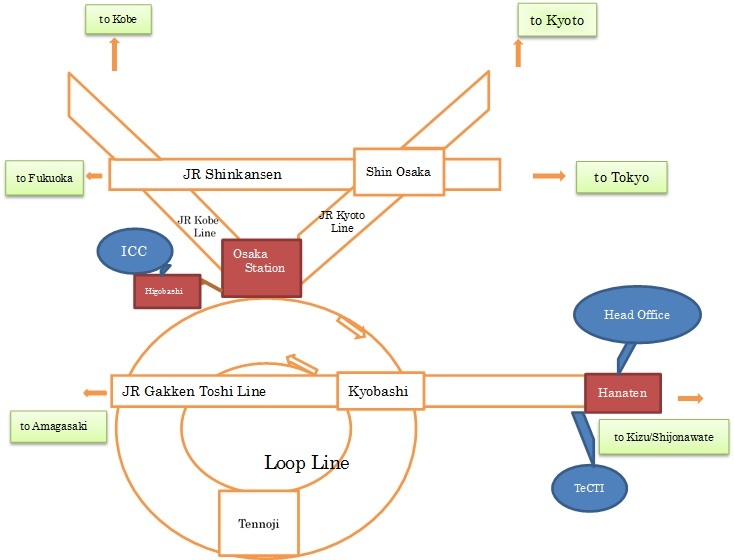 The land was donated by a benevolent person for these purposes respectively and a large grant came from the Japan Ship-building Foundation and the Cycling Promotion Association for this project. And now new building is under construction to place of center on information and culture. 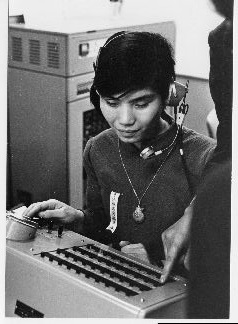 The second Chief Director Hideyuki IWAHASHI died in January, 1984 and Akiko IWAHASHI took over the overall responsibility including the cooperation to 'the Association for Ophthalmic Cooperation to Asia' (AOCA) and 'the National Committee for the Welfare of the Blind in Japan'(NCWB). It will probably be Miss Helen Keller who grieved at the death of Mr. Takeo IWAHASHI more deeply than anyone else. Mr. IWAHASHI, as the Director of the Lighthouse, dedicated himself to the work for the blind and made a great contribution. Their friendship tied firmly by human love and human agony, continued over 20 years. Mr. IWAHASHI light in his heart and invited her when the canary he had presented to her died, to Japan. Miss Keller wept out that poor Takeo had died. It is beyond our conjecture how serious a shock it was for him when he lost sight during the student days at Waseda University, and he used to say he owed it to his mother that he could stand up again. His mother's love and prayer saved him from the depths of despair. After he resumed the study at Kwansei Gakuin University his young sister accompanied him every day and helped him make notes of the lectures. Dr. Bunsho JUGAKU, a famous scholar of English literature, rendered him the various help as one of his class-mates and later as his brother-in-law. He could restore the courage and cheer surrounded by these warm-hearted dedicated people, and set up a center for the blind 'Lighthouse', and made the efforts to promote the friendly relationship between Japan and USA, as well as being an advocate of the self-help movement of the blind people in Japan. In 1920's, there was not enough understanding nor cooperation from the general public and his indomitable spirit and religious faith were the motive power of his activity. There was sometimes a friction around him but we should not attribute it to the narrow-mindness of a disabled person. Love is a torch of life and his life was a torch for many people struggling in the darkness. May glory and everlasting light be with the Lighthouse which lost the master! To Pursue the Independent Living! 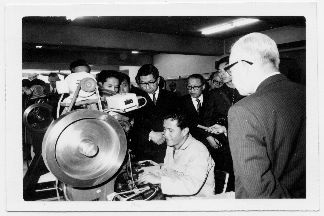 Nippon Lighthouse set up the Vocational & Adjustment Training Center in 1965 as the first one of this kind in Japan, and started 'the rehabilitation program which included Orientation & Mobility, Communication (Braille & type-writing), Activity of daily living, etc. Entrusted by the Ministry of Health and Welfare, O&M instructor training course was started in 1972. Also vocational training courses for machine operation, telephone operation, and computer programming were set up and many graduates found employment in industries and commercial offices. This was a new trial in Japan where massage, acupuncture, and moxibustion were traditionally main jobs of the visually impaired. In recent years, however, there is an evident increase of the population with multiple handicaps. The more and more clients have internal trouble, such as, diabetes, cerebral blood vessel injury, Behçet's disease, etc. They need the individual care and training program according to their physical conditions. Also, there are few in Kansai area where professional services are available for mental retarded blind person in spite of the existence of large demand. A number of persons of this group are waiting for the enrollment in the institutions or sheltered workshops but seldom given a chance. To meet such a demand, the rehabilitation center was re-organized and set up the system. We provide very various services for the visually impaired to live proudly in the local community. Especially for the multi-handicapped clients, under the motto of 'To Live together, to grow together, and to learn together', the training and guidance are done according to the individual conditions through everyday life and with the participation by their family members. The medical care is inevitable for those who are suffered from internal diseases, such as, diabetes and Behçet's disease. The nurses and professional staffs provide them with the medical support as well as the training for the independent life. O&M training with long cane, communication skills by Braille, PC, etc., and other daily living skills are given to help the clients get ready to go back to their local society or to proceed to the vocational training. The vocational training is offered for those who are able to be independent. 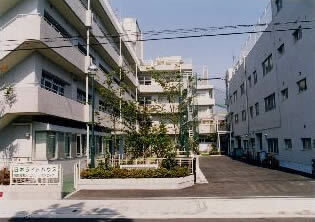 The training is officially recognized as a part of the Vocational Training School for the Disabled of Osaka Prefecture and of very high quality. Learn to how to make a various business writing with computer and how to use of the database software. And, it aims at the clerical work finding employment of a general enterprise. The aim of this course is not only to give the technical training of telephone operation, but help the trainee acquire the sense of responsible receptionist. Those visually impaired persons who have the certificate of masseur and acupuncturist practice here and get higher techniques under the guidance of the expert instructor, and prepare to become independence in the days to come. Instructor training course is conducted every year to train the instructors for the schools and institutions for the blind all over the country. This is the entrusted program by the Ministry of Health & Welfare. 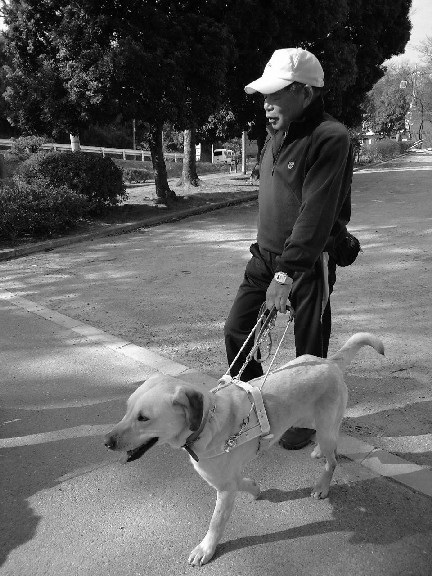 By contracting arrangement with the local authorities and autonomous organizations, the guide dog is lent out for free of charge to the blind person who is assessed to be qualified to use guide dog. To Pursue the Better & More Freedom for Information! ICC is a center to provide the users all over the country with information and knowledge necessary for the visually impaired. The services include the free lending out of Braille books and recorded cassettes and digital data as well as community services and cooperation with other libraries for the blind. 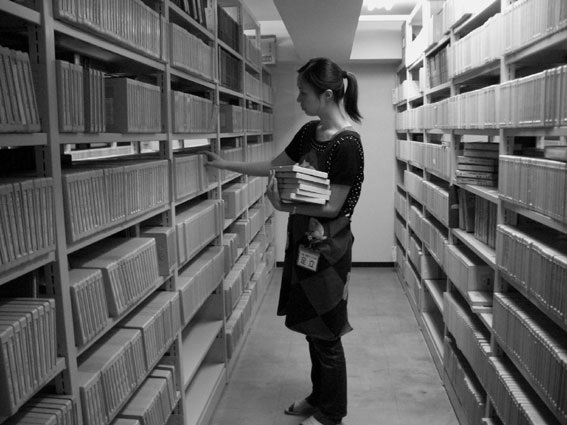 There are about 180,000 books, Braille and recorded, for free lending out. With the cooperation of voluntary workers, books are selected from a number of ink-printed books and transcribed into Braille. Also the reference books and professional books are produced to meet the needs of customers. a. Private Service: There are individual services for the blind persons such as, textbooks for the mainstreamed blind student and the books of special interest. b. Reading Service: The customers can bring in the books and materials of urgent need and the voluntary readers help them personally. The questions in wide varieties are answered in Braille, recorded cassettes, digital data, tactual graphic, etc. 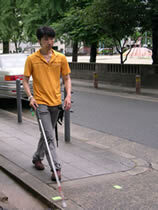 The central secretariat of national information network for the blind is also in its charge. Efforts are being made to promote the co-operations with other Braille libraries and public libraries, to provide the customers with wider access to information by inter-lending services. The training courses are conducted regularly in various areas and many voluntary workers finish training to get ready to work. More than 500 people constantly take an active part in various fields. 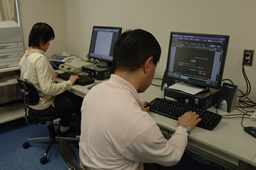 TeCTI produces the Braille books and materials by the computerized editing stereotyping system, the first system of Japanese-make, as well as trying to improve the quality of all the tactual information and the study of relevant techniques. 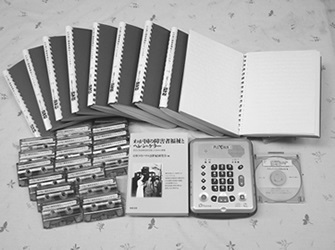 The textbooks for primary, middle and high schools for the blind, and those for the physiotherapy course are edited, printed and supplied to all over Japan. The large print books, mostly physiotherapeutic books, are published for the low vision persons. 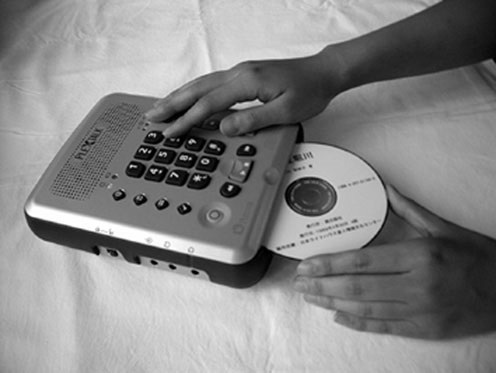 The multi-printed books (Braille and ink print) are also produced and enjoying good popularity. Entrusted by the Ministry of Health & Welfare, the masterpieces and popular story books for the children are transcribed into Braille and supplied to the libraries all over the country. The computerized editing system made it possible to publish the large dictionaries and various other books more quickly and easily. 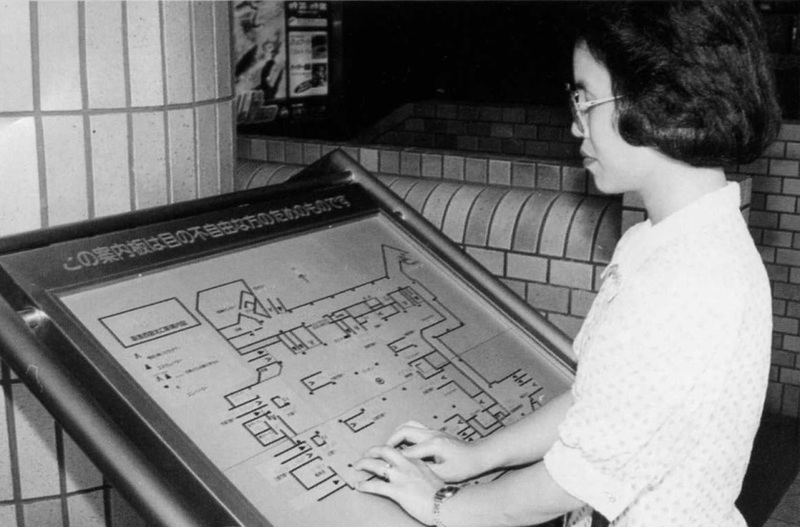 The official reports of cities or towns, manuals of welfare, guide maps, various Braille plates and seal are produced according to the requests. 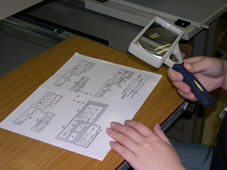 The visually impaired are handicapped from getting the figure and graphic information. TeCTI is pursuing to find the better solution in this area and based upon its rich experience offer the many kinds of graphic information.